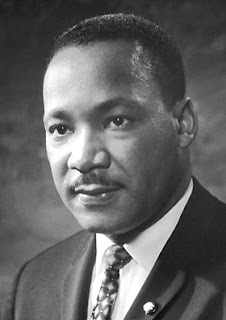 I find it interesting that, over the past few years, EVERYONE seems to suddenly love Martin Luther King, Jr. He's quickly become a national hero -- with near saintly stature in our country. He has his own national holiday, his own monument in D.C., and nearly every group of people in America has come to revere Dr. King. And rightfully so. I am ABSOLUTELY thrilled that he's now receiving this attention. But I find it strange, since it wasn't that long ago that very few people knew about Dr. King's life and legacy...or even cared. Growing up, I knew that Rosa Parks had a bus seat and Dr. King had a dream, but that's about as far as my history classes ventured into the Civil Rights Movement. And in his own time, he was wildly unpopular. A Gallup poll in 1966, just two years before his death, shows King as having only a 32% approval rating in the country. He was hated and opposed by so many people, including the FBI, that he was eventually assassinated. And yet today, King's approval rating is at 94%. 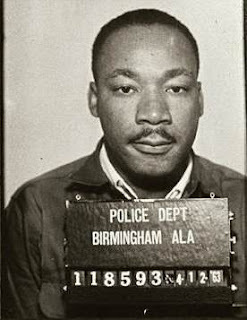 What has happened, unfortunately, is the sanitization of Dr. King's legacy. We have forgotten how radical and subversive King's message actually was, and too often succumbed to simply tweeting out a nice, catchy quotation. Again, it's fantastic that more people are learning about Dr. King and celebrating his life and work, but personally, I want to make sure I'm actually remembering the actual thrust of his message and ministry. I want to remember how fervently he fought for the poor and the marginalized, the outcast and the downtrodden. I want to remember his courageous struggle for equality and justice for all, regardless of the color of your skin or the neighborhood in which you grew up. I want to remember how he stood up against the 'powers that be' when they had turned their backs on those with no power. Jesus set the tone for us, Dr. King admirably followed in his footsteps, and we are called to do the same. May we be people who honor King's legacy by continuing his work -- the hard, radical, gospel-centered work of striving for peace, justice, and equality for all. "Don't reduce Martin Luther King Jr. to a yearly quote on social media. Live out the dream. Confront evil. Speak up. Seek justice. Love mercy. Pursue reconciliation. Build bridges. Love your neighbors. Forgive your enemies. Pray unceasingly. Live a committed life of peace, love, and justice. The God who deposited this dream into MLK is still speaking to us today. Be brave."